The 2015 analog IC market grew 2% to $47.0 billion. Combined sales of general-purpose analog IC products (amplifiers/comparators, interface, power management, an signal conversion devices) increased 2% to $19.1 billion and sales of application-specific analog devices also improved 2% to $27.9 billion. Among analog IC products the market for signal conversion devices showed the largest increase in 2015, growing 14% to $2.9 billion. 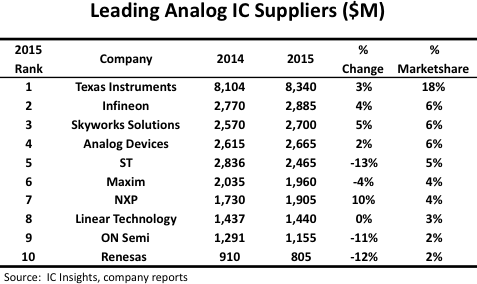 IC Insights’ ranking of top analog IC suppliers for 2015 is shown in Figure 1. Collectively, these 10 companies accounted for 56% of global analog sales last year, down slightly from 57% in 2014. Among the top suppliers, nine had analog sales in excess of $1.0 billion; five of these had sales in excess of $2.0 billion. Only tenth-ranked Renesas fell short of the $1.0 billion mark. With a 10% increase, NXP’s analog sales outperformed the total analog market by the widest margin (Figure 1). Texas Instruments was again the leading supplier of analog devices in 2015 with $8.3 billion in sales, which was good for 18% marketshare. TI’s analog sales slightly surpassed the combined revenue of the next three-largest analog suppliers, and represented 69% of its total semiconductor revenue last year. TI has always been a major player in analog, but beginning in 2009, it doubled down on its long-term efforts to dominate this market segment. That year, TI became the first company to manufacture analog devices on 300mm equipment. It purchased 300mm manufacturing tools from defunct Qimonda and transferred it to its existing fabs in Texas to build analog ICs. In 2010, TI acquired two wafer fabs operated by Spansion in Aizu-Wakamatsu, Japan, and a fully equipped 200mm fab in Chengdu, China from Cension Semiconductor Manufacturing. Both facilities were converted and immediately put to use making analog ICs. In April 2011, TI acquired National Semiconductor—its rival in many analog markets—for $6.5 billion. TI also strengthened its analog position by transitioning to 300mm manufacturing capacity at its newer RFAB and its older DMOS 6 fabs. Aside from boosting its analog manufacturing capacity, moving to 300mm wafer helped reduce total production costs by 40%, according to the company. Other changes seen in the 2015 ranking include Infineon moving up one place to become the second-largest analog supplier and Skyworks Solutions moving up two spots to #3. ST slipped from #2 in 2014 to #5 in the 2015 ranking following its 13% decline in analog sales, which it attributed to soft equipment sales (computer, consumer, automotive, industrial) among its primary customers. Collectively, Infineon, NXP, and ST—Europe’s three-largest IC suppliers—accounted for 15% analog marketshare last year. Skyworks continues to enjoy solid analog sales due to design wins with smartphones providers around the world. Skyworks Solutions makes analog and mixed signal semiconductors for Apple, Samsung, and other suppliers of mobile devices. Many of Skyworks’ power amplifier components are found in Apple’s iPhone 6 models. It has been estimated that Skyworks supplies $4 worth of content for every iPhone 6 handset. Although highly focused in mobile markets, Skyworks plans to expand into the automotive, home, and wearable markets to develop its presence in applications linked to the Internet of Things. Analog ICs such as audio amplifiers, op amps, and analog switches are building blocks for creating wearable applications. Skyworks’ wireless technology is used in General Electric healthcare equipment, and the company recently sealed a deal to supply high-performance filter solutions to Panasonic. Analog Devices’ analog sales grew 2% last year. One of its key analog ICs is a device that enables 3D/Force Touch, a feature available on the Apple Watch, the latest iPhones, and new generations of the iPad, that uses tiny electrodes to distinguish between a light tap and a deep press to trigger contextually specific controls. IC Insights forecasts the total analog market to grow 4% this year, reaching $49.1 billion and then surpass the $50.0 billion mark for the first time in 2017 as analog sales climb to an expected $51.4 billion. From 2015 to 2020, the analog market is forecast to grow at a compound annual growth rate of 6%, one point higher than the total IC market.